There is, once again, a debate in the Los Angeles theatre community. A big one. A serious one. The arguments are heated and passionate. Most often the headlines read: "Deathknell for LA Small Theatres," "Intimate Theatres Threatened," or "New Plan Will Decimate LA Theatres." I think the real issue is less about LA theatre and more about LA actors. At the very core of all the heated discussion currently surrounding the AEA 99-Seat Theatre Plan, is a very simple question (well, a short one, anyway): What is an actor? Is an actor an artist? Like, let's say, a painter or a sculptor? Or, is an actor more like a musician who picks up occasional gigs? Is an actor a craftsman? Second cousin to plumbers or carpenters? Perhaps, actors are laborers. Just blue collar working stiffs similar to our teamster friends or restaurant workers. Now before you get all up in my grill about these categories, I know, I know...I get what you're thinking. There is some crossover with all of them and certainly the lines of demarcation aren't crisp and clear. Point of fact, at any given time, and in any given production, an actor could be any and/or all of these things at once or in any combination. Bottom line is that actors, especially those based in Los Angeles, are once again caught in this terrible gray area of what their Union leadership wants for them and what they want, or maybe need, for themselves. The division lies in defining what actors are, what they define themselves as, and whether or not the Union leadership respects and accepts that. If actors are artists, then they must be given the opportunity to practice and create and collaborate at their convenience and with those they value and have respect for. Actors must be allowed to create projects that they feel are important or have merit free from the arbitrary calculations of what other artists do in other places. If actors are artists, then the people representing them must take that into account when making decisions that impact the practice of that art. If, however, actors are merely part-time laborers that take a job when it happens to come around, then the rule book needs to change even more. If that definition is true (or more true, I guess) then we have a whole slew of others things that are going to have to get sorted out. Like the number of British productions coming to Broadway and touring nationally lock, stock and stage manager. Like the growing numbers of British and Australian actors coming to the States without the equivalent number of American actors working in their wake back home. Like the extreme lack of resources directed towards actually trying to help developing theatres grow beyond just demanding that they pay people at the expense of their very existence and the actors' desires. I have been "in the theatre" most of my adult life and the vast majority of my friends and colleagues consider themselves artists. They view their life as a creative journey that requires imagination, enthusiasm, passion, and education. They know going into it that it is going to be a tough road. They accept that. So long as they can find fulfillment in other ways -- like teaching theatre at a college, like booking a commercial or an occasional under five, like taking a role that they would never get to do otherwise at an intimate Los Angeles theatre -- everything will be okay. They can proudly and rightfully call themselves actors if they are engaged with their craft and sharing the results of their work. Do actors want to get paid for their work? Of course, they do. Even though they know the odds are stacked against them. Just as painters want people to buy their canvases, actors want people to pay to see them perform. But painters don't paint only when they have a buyer lined up. They also don't sit around their apartments waiting for a commission. They paint. They create. Constantly. They expend time and energy and money as an investment into this obsession that is more than a job - it is a way of life. Imagine if a painter were only allowed to buy paint when he was guaranteed someone was going to buy a painting. The exact same thing holds true for the actor. In Los Angeles, that often means performing in a theatre with less than 99 seats in it. It means joining with other like-minded creatively obsessed theatre colleagues to collaborate -- to paint. Being an actor is a unique profession. It is unlike any other profession represented by labor unions. It is rarely, if ever, a 9 to 5 career. The coffee is worse. The uniforms change from job to job. It requires imaginative and experiential trial and error. Additionally, I think you could argue that actors are the only workers, union or otherwise, who are required to take a large part of their work home without pay regardless of contract, union status, or quality of show. Learning lines takes time. Actors do that outside of the rehearsal hall. Away from the stage. On their own time. For free. Always. That's what actors do. The world that the actor lives in is a complicated one. It is also a unique one because, more often that we would like to admit, anyone who has an Equity card (or a SAG-AFTRA card for that matter) may call themselves a "professional" even if they have no training and little to no experience. Justin Bieber has done some TV. Mariah Carey and Britney Spears have been in movies. Jennifer Nettles is on Broadway. Does that make them actors? Does that make them artists? There's a difference between actors and celebrities. To drill down further, each play and each each role requires specific criteria. Players are not cast for a role simply because they have a union card and are next in line. Each production or film or TV show or commercial has a litany of defining restrictions such as cast size, race, gender, age, etc. Each production, each role reduces the number of available actors by the specifics determined in the playwright's imagination. I mean, it's not like applying for jobs at a bank where a teller could be any gender, any age, and race. King Lear is old. Joan of Arc is a woman. Felix and Oscar are men. Acting is a hard, unfair and complicated business to be in. But as artists, few real actors working in Los Angeles would trade what they do for anything in the world despite all of these things. 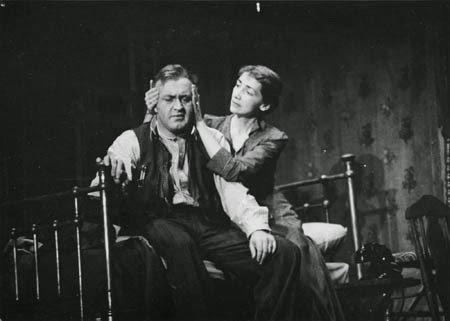 In the 1970s, a theatre professor at Loyola Marymount University, the much loved and respected Emmett Jacobs, wrote the following in an LMU workshop program: "So often in the theatre, we are so trapped by the edifice complex and all the trappings that go with it, that we loose our capacity to do artistic research." Like painters and other artists, actors do not continue to grow because they have finished drama school or college. They do not rest on their laurels because they have finally gotten their Equity card. They do not, they cannot, create in a vacuum. Actors must get on their feet, get off book, collaborate with others, try things out, fail, adjust, try again. While money is important, it is not nor has it ever been the sole factor in why someone becomes an actor. Actors are artists. They choose to be artists. Any changes in a small theatre plan should...must...accept that.